Taq DNA Polymerase (regular) is a thermostable enzyme with a highly processive 5'->3' polymerase activity and a 5'->3' exonuclease activity. The enzyme is purified from E.coli and consists of a single polypeptide with a molecular weight of 94 kDa. Taq DNA polymerase synthesizes DNA from single-stranded templates in the presence of dNTPs and a primer. A recombinant E. coli strain carrying the Taq DNA polymerase gene from a thermophilic organism Thermus Aquaticus YT-1. 1 unit is defined as the amount of enzyme that will incorporate 10 nmol of dNTPs into acid-insoluble material in 30 minutes at 75°C. 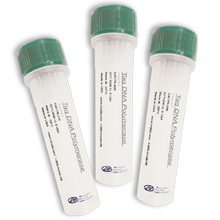 Taq DNA Polymerase is the original and most commonly used PCR enzyme. Taq excels at amplifying shorter (<5 kb) sequences from low-complexity template sources and produces robust yields with little or no optimization of reaction conditions. Consider the following guidelines when designing PCR strategies using Taq DSC 2.0 DNA Polymerase. 1. 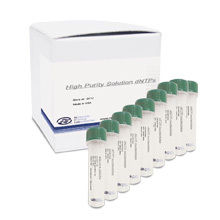 DNA Template: Although extensive purification of PCR templates is typically not necessary, care should be taken with crude or partially purified DNA sources as handling and chemical agents can adversely affect the PCR process. Exposure to short-wave UV light or other DNA damaging agents should be avoided, as should high ionic strength, detergents such as SDS, loading dyes and phenol. In order to prevent contamination from previous PCR reactions, consider setting up reactions in a positive-pressure hood and with aerosol barrier pipet tips. In a typical 25 cycle PCR, 104 copies of target sequence will yield reproducible amplification product. This corresponds to roughly 0.1-1 ng/ml (final concentration) of plasmid DNA, and 1-10 µg/ml of genomic DNA. The use of lower DNA concentrations typically produces less non-specific product, while higher concentrations can allow for fewer cycles and lower mutation rates. 2. 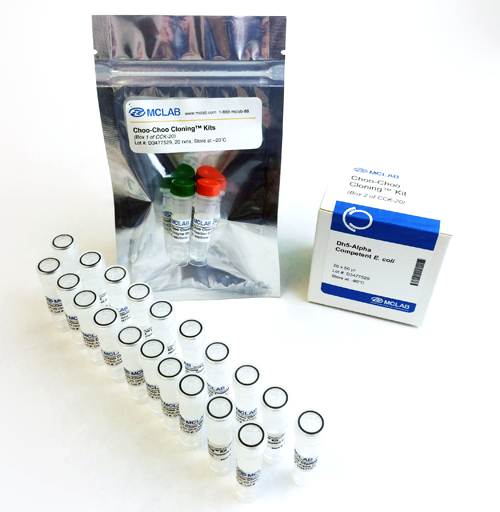 Primer Design: Ideally, oligonucleotide primers are 15-30 bases in length, nearly 50% G+C, and have equal (+/- 3°C) annealing temperatures. The use of software to detect self-complementary or hairpin-prone regions is advised and is offered as a service by some synthesis providers. Note that although the 5'-terminus of the primer may contain untemplated sequence, the 3' end must match perfectly. Typical oligonucleotide concentration in the reaction is 0.1-0.5µM. 3. Magnesium: Magnesium is a critical component of the PCR reaction though its concentration can be modulated to promote various effects. Generally, 1.5-2.0mM Mg2+ is targeted, but higher concentrations (up to 5mM) may be used to stimulate the yield of reactions at the expense of fidelity. The converse is also true - lower magnesium concentrations will promote higher- fidelity products with a lower overall amplification yield. Note that certain reaction components, in particular template DNA and oligonucleotides, may contribute chelating agents to the reaction which could lower the effective magnesium concentration and starve the reaction. 4. dNTPs: Generally, a final concentration of 100-200µM dNTPs is employed, though higher concentrations may stimulate yields (particularly with longer targets) and lower concentrations may offer increases in fidelity. Taq DSC 2.0 DNA Polymerase can also incorporate and read through deoxy Uridine and Inosine, two analogs used in certain applications. 5. Taq DSC 2.0 Polymerase: 1 unit/50µL reaction (20 U/mL) is typical, though additional enzyme may be added to stimulate yields. Taq DSC 2.0 DNA Polymerase extends a DNA template at approximately 1-2000 nucleotides/minute, so it is recommended that 30-60 seconds of extension time be provided per kb, per cycle. Appropriate extension temperatures range from 68-72°C. Because Taq DSC 2.0 DNA Polymerase exploits the natural affinity of a DNA polymerase for a duplex DNA fragment to promote its hot-start function, it does not require an extensive initial denaturation step to activate the polymerase. On ice, prepare each of the following master mixes, combine, and place in heated (to 94°C) thermal cycler.